Every master wants to impart the knowledge, wisdom that it has gained through years of its penance and learning. Samadhi and Mahayogi Pilot Babaji seem to be synonyms of each other. 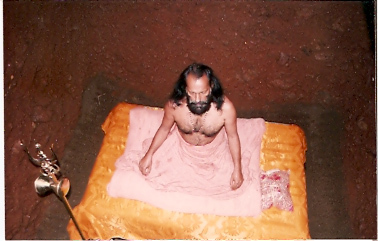 Knowing the intricacies of this sacred science makes Mahayogi Pilot Babaji different from other mystics of current age. It has been his desire to impart this sacred knowledge to sincere and serious seekers / disciple. Mahayog Foundation feels happy to announce that in the coming months i:e July, 2018, between Babaji’s birthday and Gurupurnima, a special Sadhna will be taught, for all those who want to practice Samadhi. This is a preliminary Sadhana essential prior to go in for three months intense practice for Samadhi. Mahayogi Pilot Babaji thus invites all such serious seekers/disciples , who after deep scrutiny by none other than revered Gurudeva himself will be allowed to go in for this Sadhana. Dates :- 17th July to 24th July,2018. Special rooms have been created in the form of dark rooms and caves. Limited though to practice. Practioners will be allowed to have a special diet based on fruit or even juices. Only those who qualify, will be allowed to go in for three months Samadhi course, which will be announced in due course of time.